If you are the one who is expecting to export contacts from Excel2Outlook without losing a single bit then, you are at right place because, manual data shift from Excel to MS Outlook consumes more time and efforts. Avoiding manual procedures when you are a tech savvy person will help you to gain instant access of your data within required file format. The same concept runs with Excel users when they come up to the need to export Excel contacts into Outlook format. Excel to Outlook Contacts Converter with name Excel2Outlook Converter from our brand helps to shift desired Excel contacts into PST file format along with rendered properties. Avoid Manual Method for Excel Contacts to Outlook Conversion?? If you are adopting a non-commercial way so you can convert Excel contacts into PST format then, you will have to manage hierarchy for all contacts otherwise you can lose originality of contacts. In comparison to any manual procedure for contacts data shift into Outlook format when you adopt a commercial solution for exporting, you will get relevant results within few clicks. When you are not sure that non-commercial procedure will work out or not then, you are suggested to use our easy to use Excel to Outlook contacts converter. 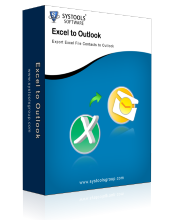 With this smooth solution one can extract Excel contacts into Outlook easily. So, users those are using Excel file format and looking for usage of Excel contacts into PST format to speed up the accessibility of contacts over different editions of MS Outlook easily then, Excel Contacts2Outlook Converter from our brand will be your reliable partner. Within our Excel to Outlook tool, you can enjoy easiness for contacts conversion as Personal, Business, and Enterprise licenses are designed for all Excel users.